Ever wanted to work on a cruise ship? This invaluable insider’s book is exclusive to the Mermaid Group and has been put together with the knowledge and experience of former and current staff and crew. Not only does the book include information for jobseekers (such as 'Creating a winning C.V' and how to write a killer cover letter and the processes) but it is also packed with everything you need to know about life onboard a cruise ship, travelling the globe, pro's & con's of the industry and employers expectations. But most importantly the guide contains crucial step-by-step advice to help you through the employment processes and secure your dream job! 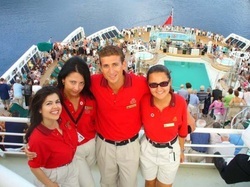 Getting a job in the cruise line industry is not like getting a job in any other industry. Our full membership professional services are designed for this industry and they really work. Get your job search off to the fastest possible start. We send your Resume direct to the E-mail inbox of over 330 companies, agencies, contractors, employers, recruiters and a whole lot more. Saving you time. Ten minutes from now your Resume will arrive at over 330 industry recruitment addresses. Due to constant staff turnover and regular new contracts there are always vacancies. Saving you money at less than 10 cents per contact. Lifetime membership - once only payment - 100% guaranteed. At no extra charge we then continue to send you further Job Application Updates. You can go on using your account with us for your entire career. Make back the money you invest in us in your first few hours of work.